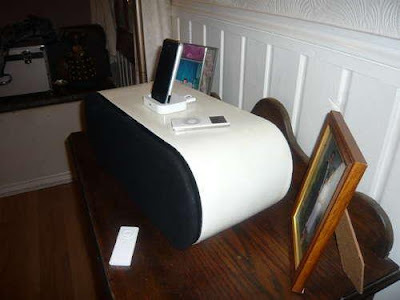 This high quality and low cost speaker was designed to be used for iPod or iPhone with the use of old car Hi-Fi speaker and some computer components. 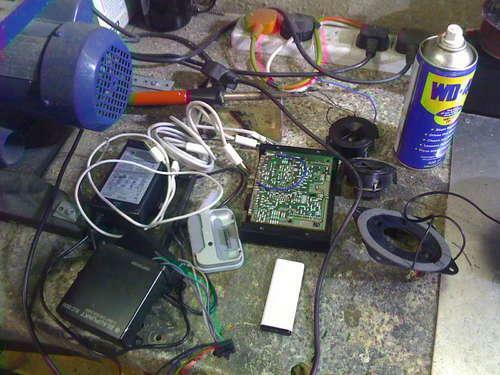 Other materials used are shown in the image below and they include an amplifier, 240V-12V power supply, tweeters, crossovers, sealed lead acid battery, MDF, filler, Apple universal dock & remote, glue, nails, and white gloss paint. 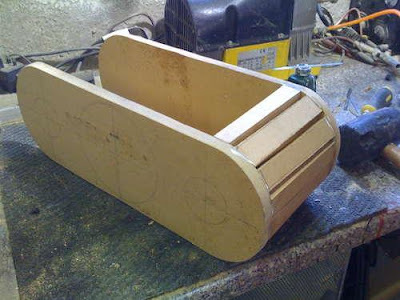 The front baffle board was drawn on a piece of MDF in order to use it as a template to make the rear of the box. The dimensions of the box based on the speaker do not necessarily need to be exact because the speakers were quite old as it comes from an old Renault 19. From the photo of the round bits below, the trusty circular saw was used to cut loads of 1 inch by 15 cm strips of MDF. Between the front and rear baffle, the strips were glued and nailed. The baffles were cut out using a jigsaw and the strips were kept as close to each other as possible. The first coat of filler can take 3 batches to finish and they were applied as neatly as it can after being mixed up. Until it was somewhere near as shown below, a few more coats can be applied. 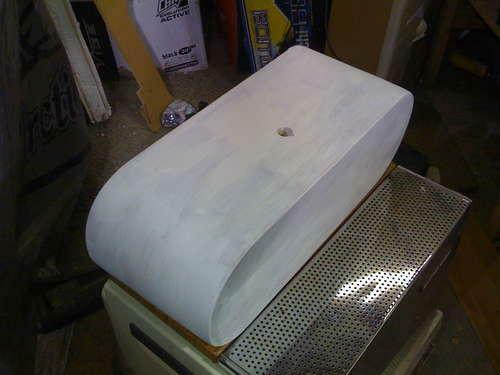 A surform will be applied until it was about the right shape once the first coat of filler had set. 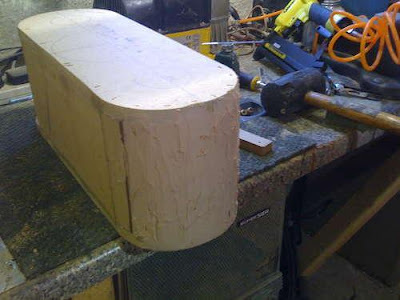 Sanding could be done by hand or it would be better to use an electric sander if available. 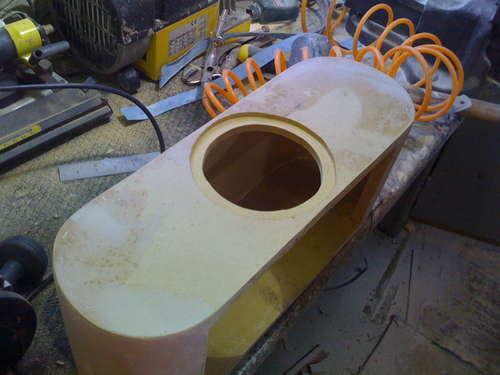 A jigsaw was used to cut out the speaker and tweeter holes as shown below and a flange for the speaker to sit into was made using the router. A hole of about 12mm on the top and 3mm on the back were drilled once all the holes were cut. 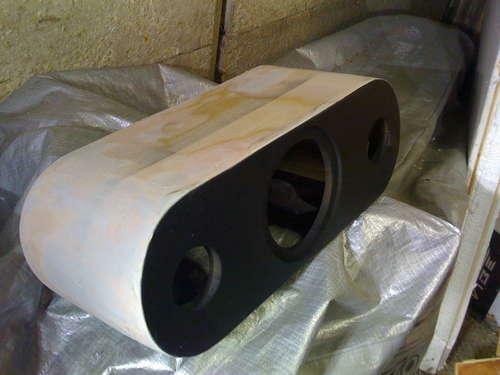 The edges were masked up and the baffle was spray painted in matt black as shown below. The first layer of white primer can be applied once the black was dry and the masking tape was removed. A couple of coats of normal white primer was applied and then followed by a light sand. In between, a bit of sanding was applied as 3 coats of white gloss were given. A grill for the front had to be made for the full fake Apple. To mark out the shape on a scrap bit of 5mm laminate flooring, this was a simple matter of using the box as a template and then sprayed it in matt black. Some black nylon cloth was glued onto the panel with some spray carpet adhesive when the paint was dry as shown in the image below. 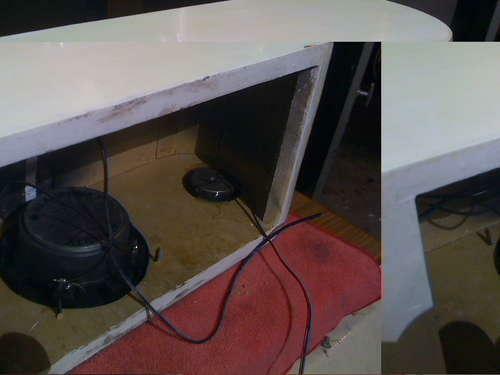 Some black drywall screws were used to screw the 13cm speaker into the box as well as the amp and crossover networks and epoxy resin was used to glue the tweeters. After soldering all the connections, the lead acid battery was glued inside as shown in the next image. The amp of the battery was powered by wiring the 12V to the battery. The iPod universal dock was glued on the top of the box with wires for USB and audio. The finished product of cool looking iPod speaker is also shown below.